I have always seen images in seemingly plain things. 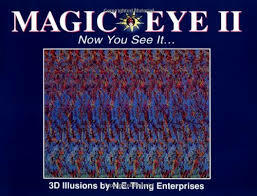 Never could see those damn pictures in those 3D Stereograms though! Remember them? I believe they were at their hottest in the 90’s. ‘Magic Eye’ art. I would stare – nose to the frame then back away, back away, back away. Ok, I think ONCE I saw something. But this was probably after some smarty-eye next to me announced what they saw “Oh look! It’s a sail boat! And there are people on it waving and one of them is missing a button on their jacket!” Oh shut up. Anyway – back to pareidolia. My earliest memories of this phenomenon would be my bedroom wall when I was a child. The wall was textured and I had a whole world living on it! I always wanted to trace around my findings in pencil and capture them. Mostly faces – but often animals, familiar characters – body parts like hands and torsos – plants and landscapes. I loved gazing at my wall and discovering new pictures. A more recent example would be my purse yesterday morning. Tile is another endless wonderland for me. I’ve always stared down at tile and found imagination gold. 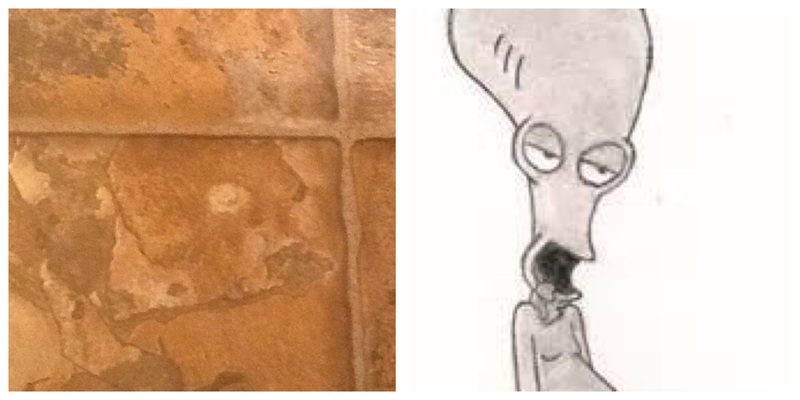 Here’s Roger from the animated show American Dad. The little perv lives in my bathroom. It’s not just objects in things – I see pictures in font too. lol <— looks like a man drowning to me. The ampersand looks like something scooting across a carpet. The great thing is I’m not alone – and my friends pepper my Facebook page with images they know I’ll see – that they see too. But did you know that pareidolia used to be considered a symptom of psychosis?! I’m pleased to announce to those friends and to you reading this that can relate – that is no longer the case. Well – as normal as someone who says ‘hi’ to Roger every time she goes pee can be.